Death Revokes the Offer by Catharine Brankamp is the first mystery in this series, first published in trade paperback in April, 2008. This is its first appearance as an ebook. Real Estate can be a mystery. Sometimes it's murder. 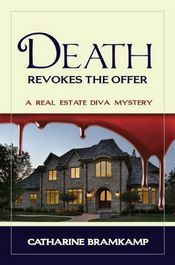 The real estate market hasn't been exactly robust in California, so when New Century Realtor Allison Little secures a legitimate purchase offer but discovers her client dead on the floor, she is not happy. Because death revokes the offer. Since Allison's last crisis was poorly applied acrylic nails, dealing with murder is not her forte. But she is determined to sell the victims' huge, expensive house no matter what it takes. Because that's what she does. Not only does the sale take paper work, it also takes courage, fortitude and a hard head. Allison must cope with vindictive surviving family members, her best friend's pursuit of the most eligible bachelor in the county and Allison's own attraction to yet another handyman. Oh, and don't forget mom.